Remove unsightly leg veins with the Gemini™ NdYAG laser. The laser light of the Gemini™ passes through the surface of the skin. This light is absorbed by hemoglobin which vaporizes or coagulates inside the blood vessel. The vessel collapses and is sealed shut. 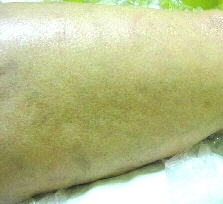 The sealed vein is then broken down and absorbed by the body over the following weeks. 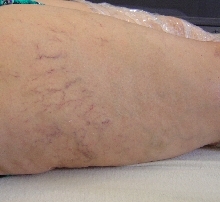 Smaller veins, less than 1.5mm, may disappear immediately, while larger veins may take days to weeks to fade in appearance. A red mark, resembling a "cat scratch", may persist for a few weeks. If you plan on having laser vein therapy, it is important that you not take aspirin or NSAIDs (Advil, Ibuprofen, Aleve, Naproxen, etc.) for ten days prior to the treatment date due to their effect of thinning the blood and inhibiting clotting. If you do take these products within ten days before your treatment then the procedure may be less effective and the risk of bruising increases. Tylenol (Acetaminophen) is acceptable and recommended for pain relief prior to treatment. After treatment, you can resume your normal activities, but you may be asked to avoid aerobic exercise or heavy lifting for about a week. Some veins may need to be treated more than once to achieve optimal results.